There are three main goals when it comes to online real estate content. The first is to build trust. The way to build trust is to educate and inform your reader. The more fabulous content you develop, the sooner the consumer will come to know, trust and like you. The second is to generate leads. Without keeping your focus on turning prospects into customers, creating content becomes nearly pointless. Here’s the thing, the more you continue to create useful and meaningful content, the more likely people are going to want to use your services. They’ll crave what you have to offer. The third goal is to dominate the competition. In order to do that, you’re going to need to continuously develop content. Great content. Content that answers questions, solves problems and empowers the consumer. Even with these three main goals, there is one thing that can sabotage all of your content creation efforts. Consistency. Or rather, lack of consistency. Without consistency, your content will flop. You will not be a successful content creator. So then, what’s the point of having a content calendar? Well, just like with all lead generation, you must have a plan. What does a plan do? It keeps you accountable. It keeps your prospecting time-focused. Yes, I said prospecting time. Your content creation is about prospecting. It’s about lead generating. In order to be a successful lead generator, you must have a plan. When you have a written plan, you are more likely to stick to it. When you know that you have specific content “coming due,” you can hunker down and create that content. Smart real estate agents incorporate this into their lead generating/prospecting time. You can too. Here’s the thing: Be realistic. Don’t try to set a schedule that requires five hours of time each week. Just don’t do it. You know you’ll find other things that “seem” more important at the time. Know yourself. Know your business. Know your limitations. Start with a couple things each week and then gradually grow your content calendar over time. As you’ve developed the habit of creating and curating content, increase what you are doing. 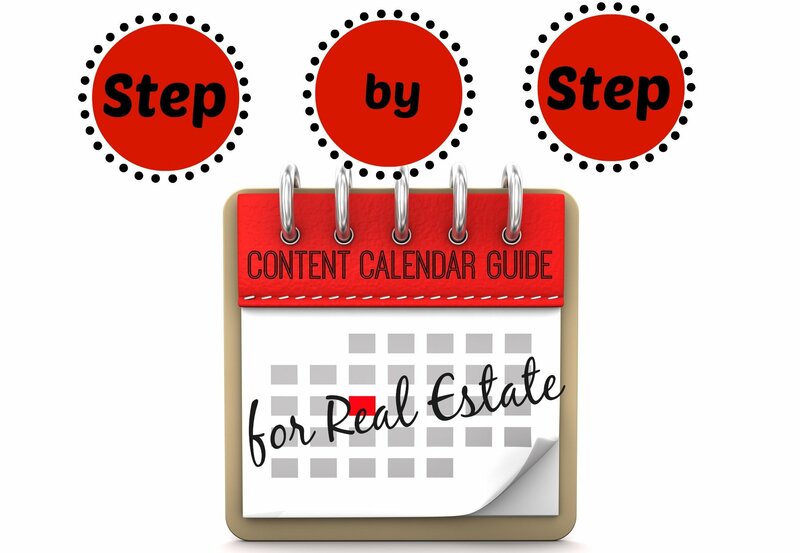 With that said, let’s move forward and create a successful real estate content calendar. One that works for you, not against you. The first thing you want to do is grab yourself a blank spreadsheet. It really doesn’t matter which one you use: OpenOffice, Google Drive, Microsoft Excel. Just pick one and use it. The next thing you are going to do is create your “master” template. Be simple, not fancy. Make it easy to create and easy to maintain. Other types of content marketing such as Press Releases/Online Classified Ads/Guest Blogs/etc. For example, If you know that everyday you want to create three to five Facebook page updates, consider what “type” of updates those will be (and no, I’m not talking about text, photo, link or video). I’m talking about how much third-party content you are going to curate, how much of your own content are you going to post, etc. A good Facebook page offers up a variety of content. From interactive, conversational text updates, to very niche-focused, third-party content, to call-to-action IDX jump links, to holiday information, to local events. You can do more, of course. These are just some examples to get you started. Plan out your calendar for a 30-day period using “template” data. To create my real estate master template I go through and start with my priority items, then go down the list until all 30 days (and three to four times each day) has been filled. First of all, I’ve committed to writing two new blog posts each week, as you can see by the publish dates of Thursday and Monday. Quote of the Day, whether from someone famous or not, something that’s relevant to the fans of the page. This is the content that you read all over the Web that has strong relevance to your fans. Things such as design elements, landscaping, etc. You should have a ton of content you’ve already written. If you don’t now, you will with a regular schedule. Make sure a solid portion of your content is “evergreen content.” In other words, it’s advice or information that doesn’t expire. Of course you want to make sure you are promoting your new content! Do you have any neighborhood pages? If you are focusing on your niche, it’s likely you have a neighborhood or niche page. This is where these fall in line. Focus on a single aspect of said page and promo that aspect. Then choose a different aspect, and so on and so forth. Listings! As a real estate agent I’m sure you just want to push your listings out there. Stop right there. Be unique. Be engaging. Take a picture of the view, take a picture of a single feature, etc. Get your fans to engage with that picture and with you. Of course, always include a link to the listing within IDX and a CTA (call to action) so they DO something, but make it interesting for them and give them a reason to do something. And no, “Look at this new listing” is not a reason. Ah! The proverbial “question for engagement.” Stop doing it for engagement. Ask questions to get to know your fans. What do they like? What do they do? Why do they do it? Get to know them! Make sure you answer the question, but don’t answer immediately. They want to get to know you too! Now that you’ve got your master template, you can start filling it in. As I fill in my calendar with content, I make sure that everything is correct: my verbiage, my spelling, my layout, links, etc. Why? Because I can simply copy and paste the content from here directly into its source. I also use a color-coding system. Red is anything I haven’t gathered or written content for; yellow is completely ready to go; and green is published/scheduled. Helps me to know what I still need to do, at a glance. If you are going to use photos that you did not take or you did not pay for, always remember that no matter where you got those photos, they are copyrighted. They are owned by someone. If you are going to use them, you MUST have a link in your post that goes directly to the source of the photos. Just using attribution is not acceptable or legal. Be very careful about using photos you do not own. And no, it doesn’t matter if you “found them on Google or Pinterest.” They are not “public domain” just because you can do a Google image search and find them. Don’t play dumb. Be smart. Be sure to use third-party content, but it should never be your main source of content. In the beginning, while you are building up your own content, you’ll have to rely on third-party content. But over time, your focus should definitely be on the content you have created, so create good content. Do not be afraid to reuse your content. Really and truly. At any given time, when you post something, less than 5 percent of your fans are going to see it. Posting things multiple times over time (not over the same day) is absolutely OK! Not only that, if you’ve used something one month, you can easily use it again three to four months later. Things like your QOTD, Questions, Neighborhood Promos, etc. All very reusable — just be smart about it. When choosing your times to post to Facebook, watch your insights. Find out when your fans are online. Those are the best times to post. It doesn’t mean don’t post other times, it just means to make sure you’ve got content going out during peak times your fans are online. OK. Now that you’ve got your template and you know how to fill it, where on earth are you going to get content? Since this article is already nearly novel length, I’ve written another one that answers this question. You’ll find it here: The #1 Real Estate Content Creation Tool You Should Be Using. 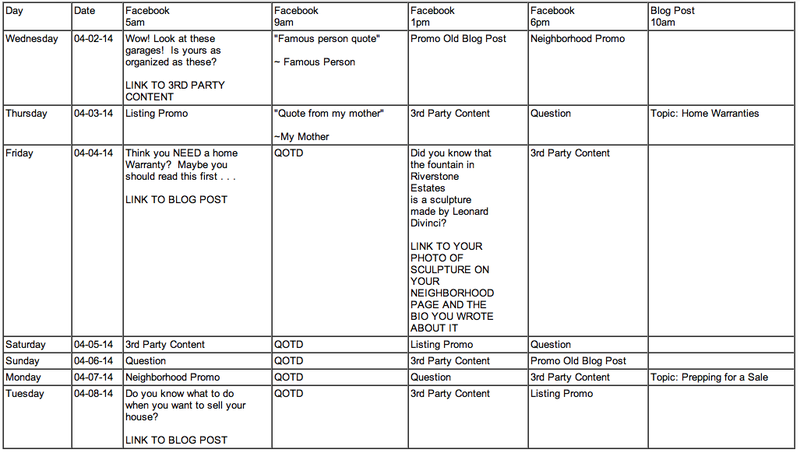 Now, my questions for you are … Do you use a content calendar? How is it working for you?